I think you’ll agree with me when I say getting more FREE traffic to your website from organic Google Australia search results would be pretty awesome. More credibility for being ranked near the top of Google search results. But what should you do if you don’t have any budget to spend on hiring a professional SEO agency in Australia to help? In this article, I’ll show you step by step exactly how to search engine optimise your website and improve your rankings with 100% free tools! Note – Don’t waste your time reading this if you already have so much traffic & leads that your business is set for life. However, if you could use some extra traffic to your website, keep reading! Section 3 – How does Google decide which website rank for certain search phrases or keywords? Here is a super short summary of the guidelines in this post. SEO is actions you take on and off your website to improve its ranking in search engines. SEO is valuable for businesses because millions of people around the world use search engines to research products and service BEFORE they buy them. Google decides which pages rank the highest based on an algorithm which assesses over 200 factors with quality of website content and back-links being the most important. Section #1 – What is SEO? SEO is the process of increasing your websites ranking in the organic search engine results for specific keywords related to your businesses products and services. The higher your website ranks in search engines, like Google, the more traffic your website will receive and therefore the better chance you have of generating new leads for your business. Gaining clicks to your website through organic search is different to paid search services like Google Adwords whereby business owners are required to pay for each and every click . When talking about SEO Google is often the focal point as Google is by far the most commonly used search engine with millions of people using their website every day to look for new information. Section #2 – Why bother to rank your website in Google Australia? Imagine you’re looking for a good air conditioner installer in Melbourne. You type into Google Australia “air conditioner installer in Melbourne”. After checking a couple of the reviews, you open up the websites of the top 3 results and get more information about possible air conditioner installers. Then you call up the best looking one and order their services. Consumers are searching in Google BEFORE they find products or services which makes the top page positions in Google highly coveted! Section #3 – How does Google decide which website rank for certain search phrases or keywords? There are many factors that Google uses to determine which pages should in search engine results. Google has stated that they use well over 200 factors (and growing) to determine keyword rankings. Full of rich media like images, video embeds and custom graphics. Now this is an extremely simplified view of the factors Google uses. If you would like to know more detail about all the other factors Google uses to rank sites, click here to read a recent report on the subject by SEO expert Brian Dean. Ask other website owners to link back to your high quality content. If you do those two tasks you will get a lot of return for your time. Bare with me as none of this will make sense yet. I have laid out in the sections below step by step how to conduct end to end Seach Engine Optimisation on your own website with 100% free tools! 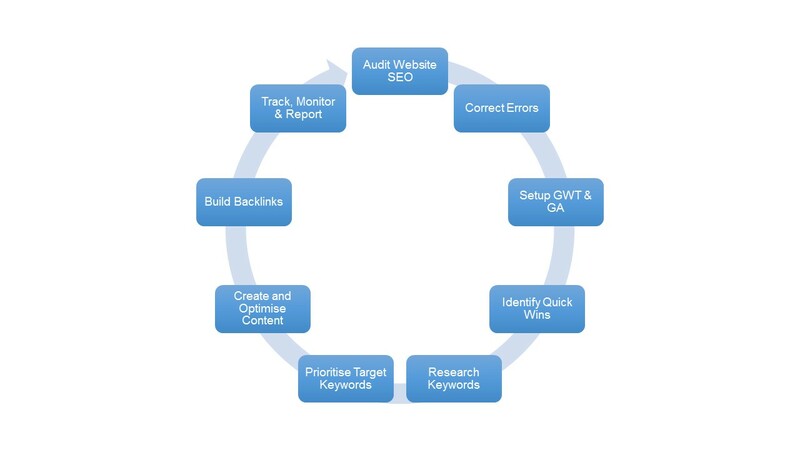 The first step of any SEO process should be to conduct an audit of the website’s current state. Basically we’re trying to find any issues that may be restricting your websites ability to be visible in search engine results. Verify code is WC3 compliant (Advanced). I randomly picked an accountant company in cheltneham called noelmay.com.au and ran it through Wooranks audit tool. No Facebook or Google Plus page – the business does not have either of these social media accounts. This report will give you a great starting point to finding simple SEO errors to be fixed to help your site rank. Page speed is an important factor in both determining your search engine rankings and keeping browsers happy. Browsers as a general rule have a very short attention span and will often make a decision in less than 5 seconds whether they will stay on your website and read your content. Therefore, you need to ensure that your website loads as fast as possible to get the best possible chance of browsers staying on your site! As a rough rule, you want your website to load in less than 2 seconds. For this example I’ll go ahead and use Pingdom. Enter your URL and select the test from a location that your potential customers will visiting you from. In this case, Melbourne is the most likely location of someone looking for this accounting business. In this particular case the page load speed of 3.76 seconds is a little high given how small the page size (501.6kb) is. Typically you’d expect to have a page load speed of around 1 second per 1 mb. Given this, we will need to dig further into the cause of the slow load times by looking at the “File requests” section (see below). This shows that the locating of the domain (noelmay.com.au) and the loading of an image on the domain are taking around 2 seconds. This needs to be corrected to ensure a faster load time and better ranking in Google. Broken links on your website are not only bad for browser experience but can also impact on the way Google ranks your website. Therefore, it is best to check that your website doesn’t contain any broken links! 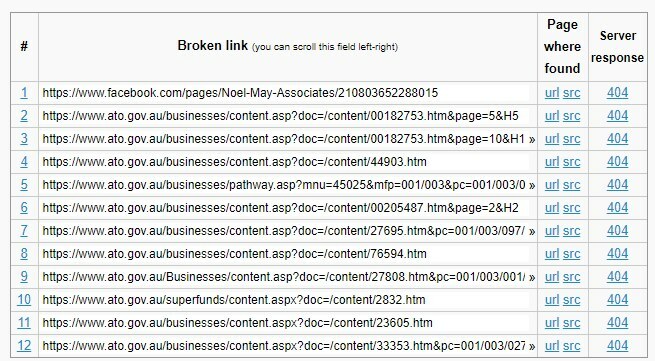 Link by link, go through the output screen and fix the broken links on your website. The SEO Spider is software that you need to download onto your computer which can crawl your website to gather a large rank of SEO data to help you correct errors on your website. Now that you have identified SEO errors on your website you’re going to have to go ahead and fix them! If you are not familiar enough with amending the coding or content management system (i.e. WordPress, Drupal, Joomla) then I suggest that you hire a developer or somebody that knows that they’re doing. If you want to have a crack yourself – make sure that you backup your current site before having a go! Google is a great resource for finding step by step guides on how to resolve the technical SEO errors you are trying to fix. Create mobile responsive website version. Google Analytics will tell you a lot of detail about the visitors to your website including how many visitors, where the visitors live, what devices visitors use, which websites send you traffic, which pages are the most popular, how many visitors convert to leads and much much more! 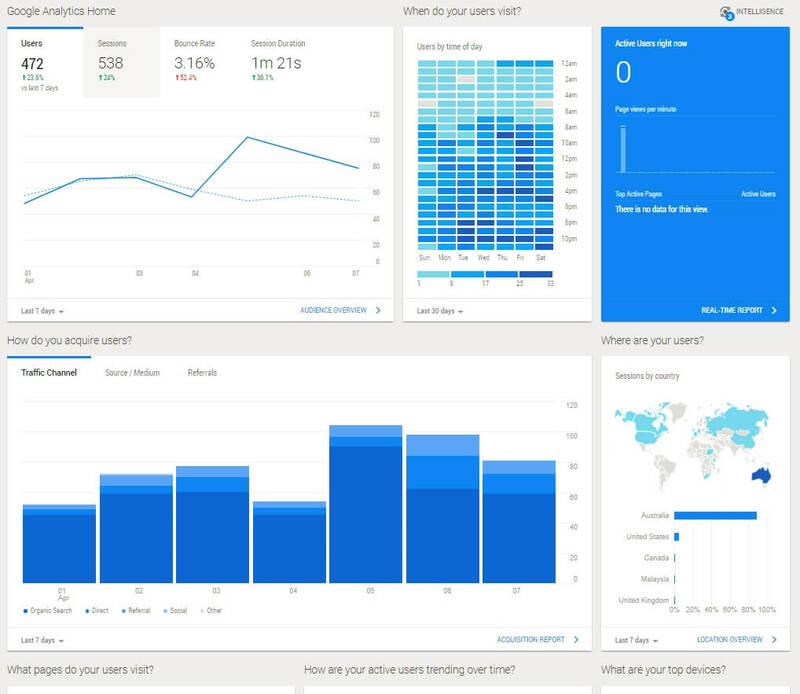 Review the multiple dashboards available in Google Analytics. Once Google Analytics is setup, wait a couple of hours and your site (assuming you’re receiving traffic) will start to see some data trickle through. 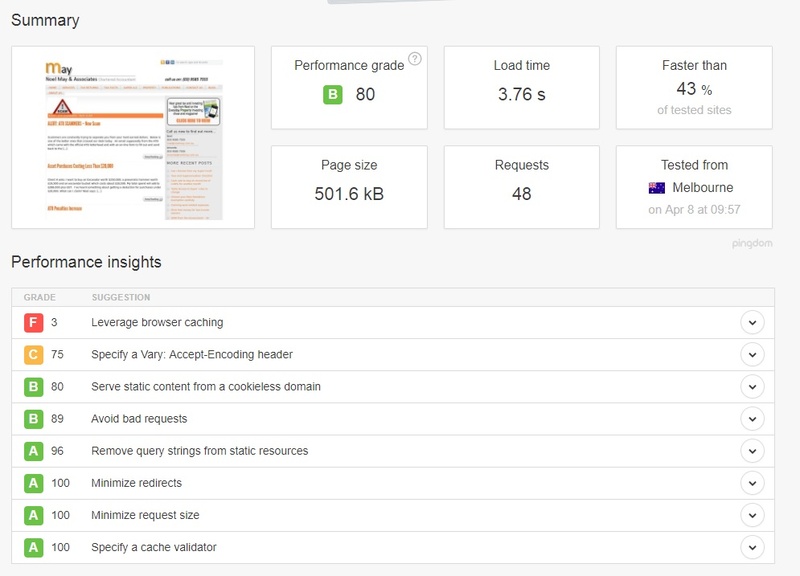 This data is super useful to monitor and track the SEO improvements you are making to your website. Google Webmaster Tools (GWT) is one of the most important SEO tools. Setting up GWT is similar to GA.
Also, while you’re going with your fancy new Google account you may as well setup and configure your Google My Business page. Setting up Google My Business is similar to GA & GWT. Why install Google My Business? Google My Business is a free, very easy to setup dashboard where business owners can manage their business profile in Google. Creating a Google My Business profile for your business is a no-brainer as it will help customers find you (even if you don’t have a website yet! ), improve your overall website rankings and help build trust with new customers. 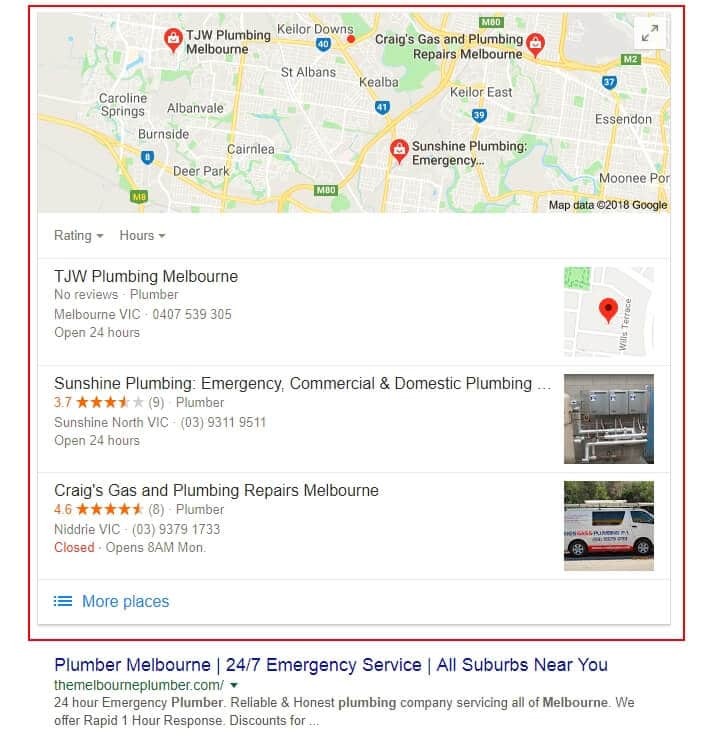 When someone searches for a local term, for example “Plumber Melbourne”, you might notice that a map listing will populate with 3-5 of the top businesses name, phone number, address and reviews (see image below). All this information comes from their Google My Business page – which is why Google My Business is a must for all business owners, even if you don’t have a physical location! One of the quickest ways to improve your rankings is to optimise for keyword that you’re already almost ranking for. You can check this by logging into Google Webmaster Tools (GWT). Go to the “Search Traffic” and then “Search Analytics” section of “Search Console” (see image below). This will provide a list of keyword ‘queries’ that your website is already ranking in the search engine results for. Make sure that you have “clicks”, “impressions”, “CTR” and “position” checked with the radio button on “Queries”. Click the “Impressions” results column to sort the column by the largest number of impressions. Look for opportunities where you have a high number of impressions (100+ per month) and the “position” is between 10 and 20 (which is the 2nd page of Google). To find out which page is already ranking for a certain keyword, click the keyword under the “Queries” column. This will display only the data for that particular query and not the whole website. Then change the radio button at the top of the screen from “Queries” to “Pages”. This will give you a list of pages (hopefully just one) ranking for the query. Now that you know the keyword query and page to optimise, it’s time to update your page with some new content. Keyword Research is an important process where try and find keywords that potential customers will use to find your businesses products and services. Keyword Research is typically conducted using a range of expensive software, but for the purpose of this guide we’ll show you how to complete basic keyword research for FREE! At the end of completing Keyword Research we will result in a list of keywords and an estimate of monthly volume difficulty of ranking. 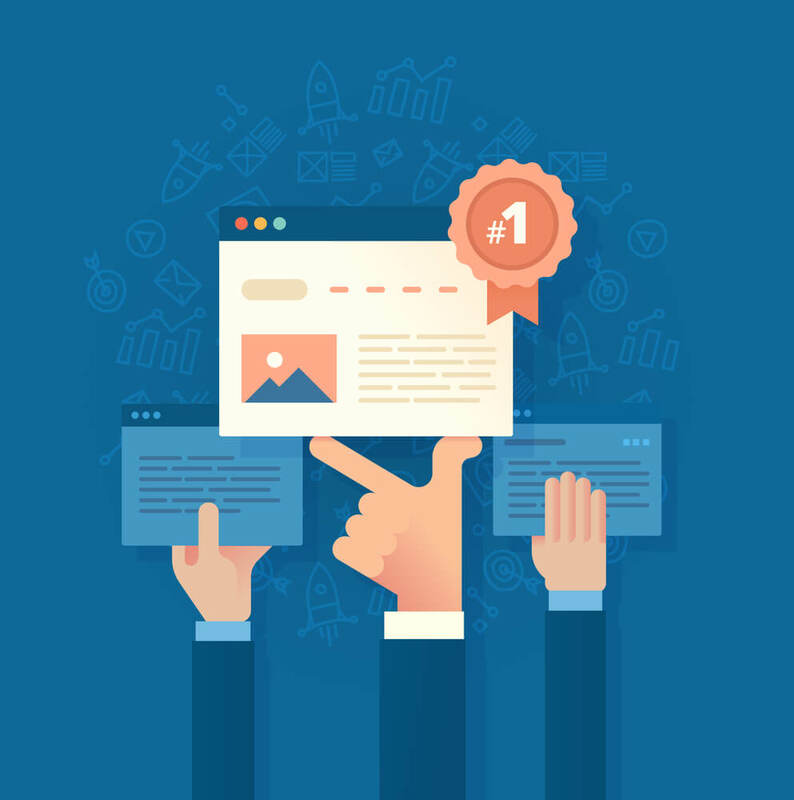 When you get the Keyword Research right and write the right content on your website, you can setup your business website up to receive boat loads of free traffic from search engine results. Keywords Everywhere is an awesome free tool that adds search volume, cost per click & competition data to Google Search, Answer the Public, Ubersuggest and many other platforms online. The easiest way to show you how to do Keyword Research is to use an example – so let’s use a Melbourne Plumbing Company. As you could imagine, it would be extremely beneficial for your business to rank highly for plumber Melbourne. The next step I do is scroll down to “Searches related to …” at the bottom of the screen. 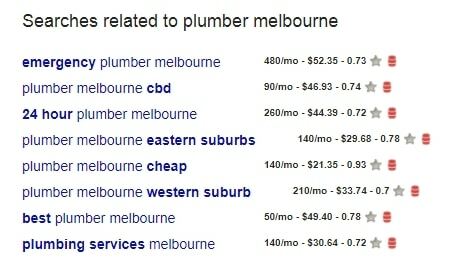 This will show me other similar searches the people have used that are related to “Plumber Melbourne”. Unfortunately, all of these keywords are also highly competitive (0.70 to 0.93!) so they will again be difficult to rank. When I run “plumber melbourne” through this tool I get “516 Keyword Ideas Found For plumber melbourne”. Unfortunately, you need to manly sift through the list, but after a while I find the keyword “bathroom plumbing” which looks interesting with a decent 210 searches per month and a competition of 0.39. If our example plumbing company provides bathroom plumbing service, this could be an attractive keyword to target. Seed Word 2: My next seed word would go down a level to one of the specific services my plumbing company provides for example ‘blocked drains’. This would be a great keyword to rank for as it is specific to the service and the location that I’m providing it from. The volume is great and the competition is a little on the high side, but still worth adding to our keywords list. Next Seed words: I would basically repeat the process above by using more words related to my businesses services and products. For the plumbing business in the example above, I would research further into services like gasfitting, hot water installation, bathroom renovations etc to build out my full keyword research list. Unfortunately, you have a finite amount of time to complete SEO tasks and you will need to prioritise the keywords which you target. the intent that searches have when using particular keywords, focusing on the ones where searches are more likely to be close to buying. Whilst you will need to decide yourself which products and services are the most important (highest margin, most popular etc) to promote, you will need to assess the intent searchers have for each keyword. Awareness – Potential customer isn’t aware about what they’re looking for and they are most likely not about to buy something. Content is the body text that goes on your website pages. Taking the target keywords that you found in the previous step, you need to try and write the best possible article on the internet about this topic. 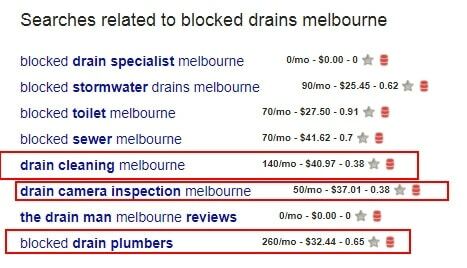 Meta Description: Looking for a good Melbourne Plumber? Then look no further. We’ve been providing plumbing services in Melbourne and surrounding suburbs for over 30 years. How to Write High-Quality, Long and Detailed Content? Most people don’t like writing articles for their website, so the idea of writing a 2,000 word content can be a little daunting! The easiest way to write a long article for your businesses’ website is to write a comprehensive “Ultimate Guide to [Your Industry]”. But what if you’re struggling for “interesting points” to write about? If you have Keywords Everywhere tool installed you should be able to see search volume next to each question. Make a list of questions with search volume higher than 10 per month. Convert the questions you found in step 6 into a sensible headline for your “ultimate guide” and simply write a 200 word answers. Write an introduction and a conclusion, and you’re done! What If You’re Still Seriously Struggle With Writing? Then the other alternative is to hire freelance writers to write articles for you from places like UpWork, TextBroker & Fiverr. A backlink is a link to your website’s URL that is located on another webpage. These are links that you create on your website that link to the inner pages of your site. External links are harder to get because typically you do not have the ability to publish on other websites. Google My Business – we discussed setting this property up above. It is an absolute must to get this nice backlink for your business from Google! Social Media – create branded profiles on social media platforms (Twitter, Facebook, Tumblr etc) and add your URL to each profile and add links to your articles where possible. Blog Comments – Leave comments on other people’s blogs (Tip, Google search: blog [industry] “leave a comment”) and use your website URL. Guest Posts – offer to write articles for as an industry expert on other websites in your industry or local area. Email Outreach – ask other website’s to link back to your “Ultimate Guide” content. Given all of the effort that you’ve put into the previous steps we need to measure the improvement in search engine rankings. We’ve already done a lot of the hard working setting up Google Analytics and Google Webmasters tools in the previous steps. We now need to review reports in these systems to see what changes have occured. I suggest reviewing these systems and check for changes in visitor numbers and keyword rankings – don’t forget to hunt down those ‘quick wins’. Now that you’ve come to the end of the SEO process, it’s time to return to the start and go all over again. SEO is a continually process of research, tweeking and evaluating the results of your efforts. And for that reason SEO is never really done…only just started. SEO seems simple enough in theory but as the awareness of its value to business continues to rise, so to will the competition to rank for certain keywords. Therefore, you need to constantly monitor the performance of your website in search engine results and be ready to make changes when your rankings start to slide. Hopefully this guide has given you the confidence to perform your own DIY SEO in order to get your businesses website ranked in Google Australia. Feel free to add your thought, experiences, opinions and questions in the comments below.